Connect a DisplayPort -equipped display through USB 3.0, for an HD external multi-monitor solution. The USB32DPPRO USB 3.0 to DisplayPort Multi Monitor Adapter functions as an external DisplayPort video card, turning an available USB 3.0 port into a DisplayPort output, with support for high resolution 2560x1600 video, and 5.1 surround sound audio. The USB 3.0 DisplayPort adapter delivers a convenient, high-performance external video solution that makes it easy to add multi-monitor capability to a USB 3.0-enabled desktop or laptop computer (optimal performance from USB 3.0, backward compatible with USB 2.0).Leveraging the high-bandwidth (5 Gbps) SuperSpeed USB 3.0 interface, the adapter delivers smooth, high-definition content to your DisplayPort-capable display, and can be used to mirror your primary desktop, showing the same image on each display, or to extend your desktop to double your workspace and increase your productivity. The USB 3.0 Display Port adapter is USB-Powered device, making it easy to add additional graphical capability to your system, without opening the case or voiding system warranties or having to find an available wall power outlet. 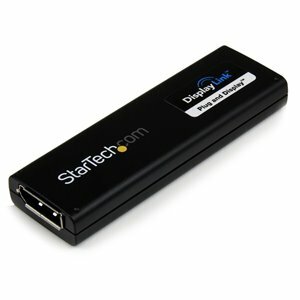 Add an extra DisplayPort output to your desktop or laptop computer in minutes. Our external USB 3.0 to DisplayPort solution allows you to enjoy multiple monitor efficiency without opening your computer case. The USB32DPPRO USB 3.0 external video card is ideal for a wide range of applications including web browsing, multi-media presentations and video playback.